For the love all things food, home, craft, and garden. One of my three favorite food groups: pasta, cheese, and wine. You can imagine my glee when my hubby surprised me the other day with a cookbook from Flour + Water, a hit pasta and pizza restaurant in San Francisco. The cookbook is simply named Flour and Water: Pasta. In my never ending quest to master homemade pasta, you will be seeing many of my attempts at recipes from this book over the next few months. Just by doing this first recipe from the book I learned 3 awesome new techniques: how to really make dough by hand, how to properly run dough through a pasta machine, and how to make pan sauces. Now, it’s not like I haven’t done those last 3 things before–I just didn’t do them as well as I could have. This ravioli dough is truly luxurious. It’s so egg-y–the yellow color is gorgeous, and the texture is as smooth as can be imagined. Please see my post Ravioli Dough for the full details and recipe. Once the dough is made, rested, and pressed and stretched into sheets, I (along with my hubby and friend Sean) made these cutie pie, caramel-shaped pasta shapes. Once the pasta was boiled to al dente, I added it to the sauce. On the sauce… The key is to keep the fattisu moving quickly as you’re swirling them in the sauce, being careful not to cut into any of them. This was tough with 70+ fattisu all at once, so I’d suggest using the biggest pan you have. I suppose you COULD do it in 2 batches, but I don’t have the patience for that. Also, Chef McNaughton suggests continuing this process until the sauce coats the back of the spoon or when you drag a spoon across the bottom of the pan, the sauce stays separated for a few seconds. He’s absolutely right to do that, but for me, once the sauce was at that point, I turned off the heat, and started to serve 4 portions, 1 portion at a time. That extra few minutes of portioning meant that my sauce continued to thicken and thus was less “sauce-y” by the time I finished. Thus, I’d recommend increasing the chicken stock AND stopping the sauce/fattisu tossing juuuuust shy of the “coat the back of the spoon” phase. Now, how did it all taste? Some parts awesome, some not so awesome. The idea of adding vinegar and mustard was intriguing to me. Mustard??? In pasta?? 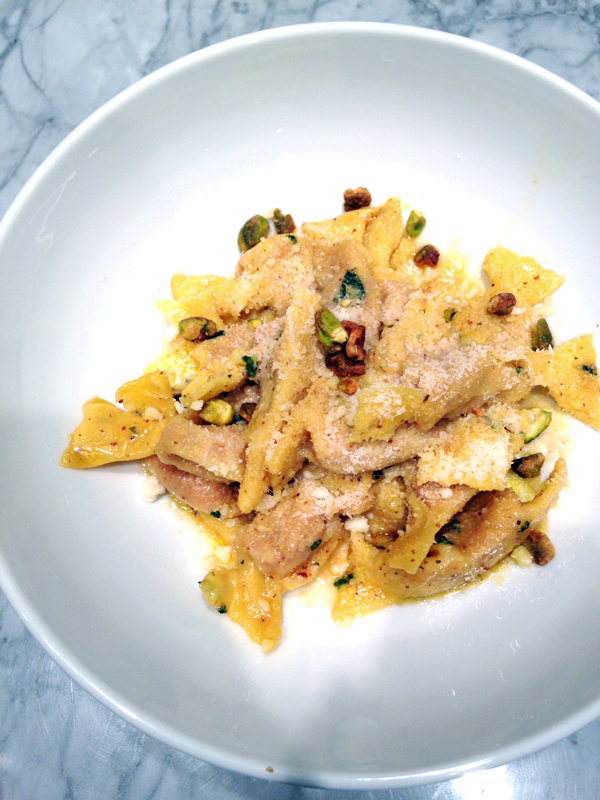 It really worked to balance out the rich mortadella. And mustard and cabbage are a traditional combination. But the mustard/vinegar level was just a bit TOO high for me–it overpowered some of the elements. I’d probably reduce those levels a bit to achieve a better balance. Those critiques aside, the dough was incredibly tender, the combination of textures was so pleasing. For the 4 of us eating, there wasn’t a morsel left in our bowls. I’d call it a win. Dust 2 baking sheets with semolina flour and set aside. 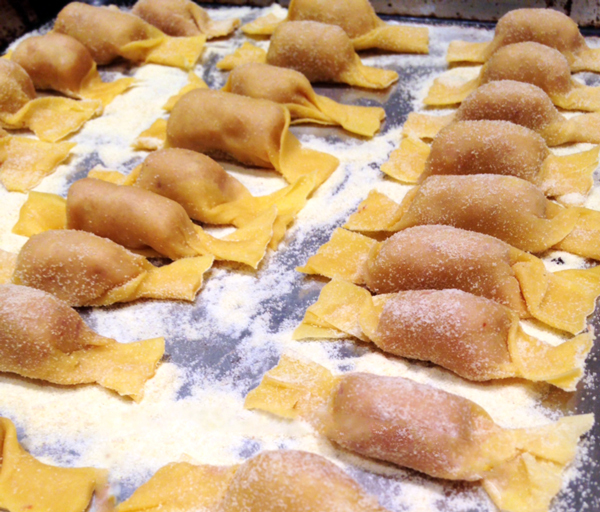 To make the pasta, using a pasta machine, roll out the dough until the sheet is just translucent. Cut a 2-foot section of the dough sheet and cover the rest of the dough with plastic wrap. Using a straight wheel cutter or a knife and a ruler, cut the pasta sheets into rectangles measuring 2 ¼ inches x 2 ¾ inches. Using a piping bag or a spoon, place 1 teaspoon of filling in the center of each rectangle. Fold one long edge just over the filling (like you are folding a letter) and then roll through to finish the fold. Use a spritz of water from a spray bottle to help seal if necessary. Gently press out the air around the filling by running your fingers from the tip of the triangle downward, creating one airtight lump in the middle. Twist each end of the pasta 180 degrees (one half turn) in opposing directions and flatten the ends so the pasta looks like a wrapped caramel. To finish, bring a large pot of seasoned water to a boil. Bring the stock to a simmer in a 12-inch sauté pan over high heat and reduce by half. Once the stock has been reduced by half, add the butter. At the same time, drop the pasta in the boiling water. Add the mustard and the parsley to the pan. Once the pasta is cooked 80% through, until almost al dente, about 2 to 3 minutes, add it to the pan, swirling until the sauce coats the back of a spoon. Add the apple cider vinegar and cook until the pasta is tender, about 2 minutes. Season with salt. To serve, divide the pasta and sauce between four plates. 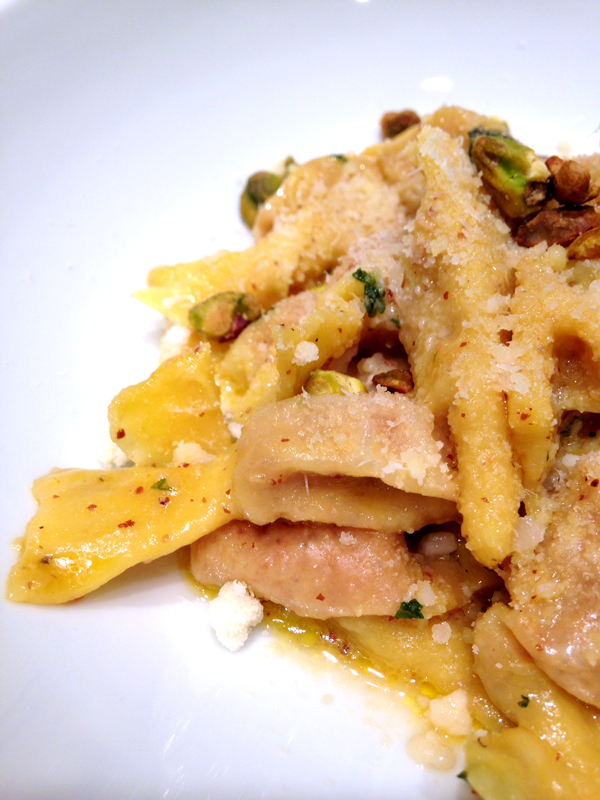 Finish with grated Parmigiano-Reggiano and toasted pistachios.